Ka-Pow! I am blown away by all of the action-packed details in this boy’s superhero birthday party by Michelle of Little Wishes Parties. Many months pregnant, Michelle put her party planning super powers to the test and pulled off a superhero birthday party for her little boy that I’m sure will be talked about for years to come. Don’t miss the super creative details of the themed cake, cupcakes, decorations and party favors, perfect for those little super heroes in your life. 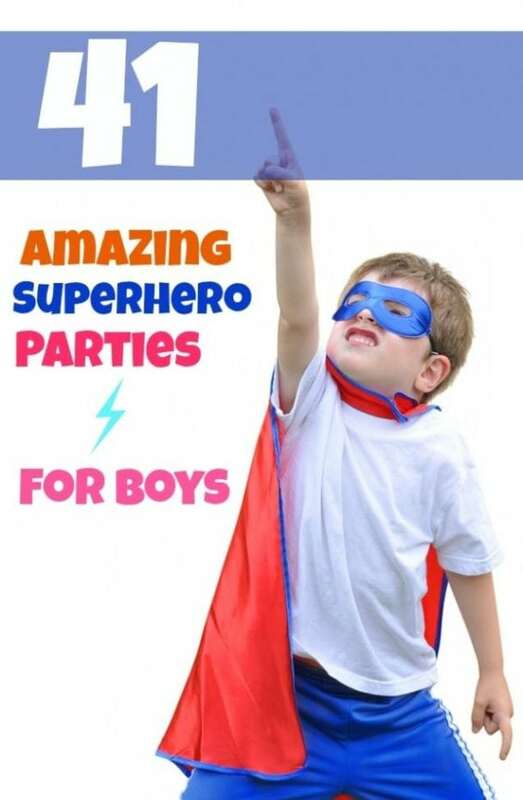 Your super hero-loving son will adore this Boys Superhero Themed 5th Birthday Party. Be sure to check out the colorful ideas in this Super Hero Party Dessert Table! This party really popped with bright colors of red, yellow and blue with elements of pop art polka dots and a comic book super hero paper backdrop. Even the balloons coordinated with Spiderman and Batman detailing. Guests at this super hero party just might have been powered up enough to leap tall buildings in a single bound after feasting on the yummy food Michelle provided. In Michelle’s words: We went with the traditional party food; mini hot dogs, chocolate crackles, [kryptonite] jelly and homemade mini cupcakes [with the cutest Batman and Spiderman rings used as toppers]. We all know how beautiful cake pops, candy bars and dessert tables can be, but if you’re on a budget or want to go with a more practical approach, you can still achieve exactly the same effect. Superhero gingerbread pops were on the menu and were also used to embellish the cake as cake toppers. With a budget she wanted to stick to, this made the cake affordable. Other clever themed desserts also complemented the look Michelle was shooting for. There were packages of “pop” candy and “splat” suckers, as well as “kapow” chocolate bars. Superheroes are not really that super without their capes. Michelle made each guest their own personalized cape by adhering sticker paper on the cape with their initial. Such a time and budget-friendly idea! Little heroes flew around the party scene and enjoyed time with the hired Superman party entertainer who came to save the day and rescue Michelle from an exhausting day. The superhero dining tables are awesome. Covered in a comic strip color book tablecloth, the table served as a great activity center for the kids too. Look at those out-of-this world superhero chair covers. One of my favorite details of this super hero birthday party is the homemade telephone booth. Is that cute or what? I agree Michelle! What a fun photo prop to play in and enjoy during the party. Way to help “Super J” save the day Michelle!